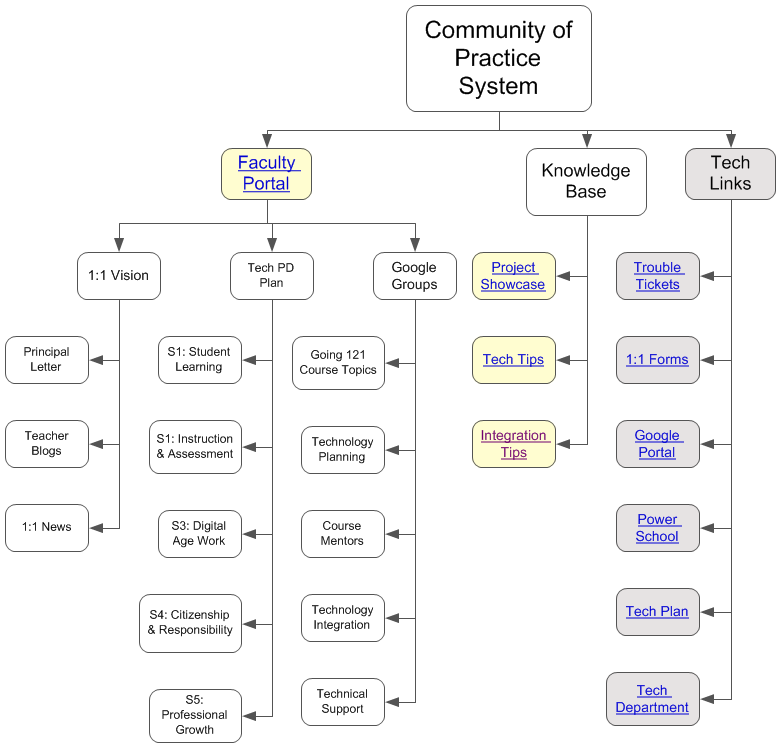 One way to support a community of practice is by building an online professional learning knowledgebase that teachers can contribute to. Such a digital hub (Ross Cooper, Edutopia) can be built with Google Sites, supporting the same tools teachers can use in their classes and for parent communication. Below is a set of hubs for schools going 1:1. Site templates are in yellow. Templates contain sample content which may be deleted or customized once they are copied to client school Google domains. The teacher ePortfolio template should be the last to customize, after local sites have been created from the other templates, so that the menu to these sites can be updated. This way, each teacher's ePortfolio serves as a personal dashboard into the CoP.